As we gather this weekend to commemorate the Union capture of Mobile Bay, let's likewise celebrate an earlier siege of our bay's Confederate fortifications. This little known campaign also lasted a few weeks, but ended when Admiral David G. Farragut's fleet turned tail and steamed back to their home bases. The engagement has been painstakingly documented and illustrated by Mobile attorney, author and historian Sid Schell, who died this past June. 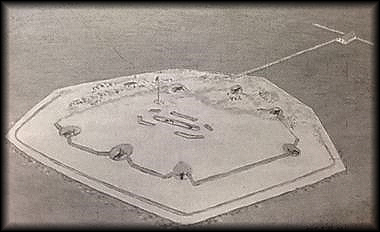 What Fort Powell would have looked like, drawn by author and historian Sidney Schell, and included in his book. According to Sid's meticulous research: The first Battle of Mobile Bay occurred in the winter of 1864, some seven months before the Yankees attacked Fort Gaines and Fort Morgan. Farragut originally tried to breach the bay's defenses through its western approach, from the Mississippi Sound side of Dauphin Island, defended by valiant Fort Powell and satellite gun batteries at Cedar Point and Little Dauphin Island. Imagine the main defense, Fort Powell, built on sand piled onto a shallow oyster reef then located about where the middle of Dauphin Island Bridge is now. Imagine the smaller gun batteries placed near the terminal points of today's Dauphin Island Bridge, one at Cedar Point on the mainland, and one on Little Dauphin Island, the first solid ground you reach as you approach the island. Together, these fortifications were built to keep the Union from entering Mobile Bay from the west. 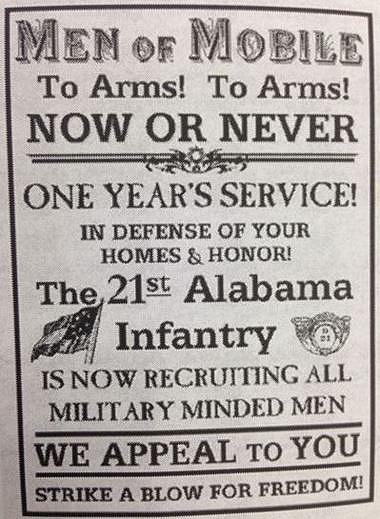 A recruitment advertisement from the pages of The Mobile Register, included in Sid Schell's "Fort Powell and the Civil War." Manning Fort Powell was the 21st Alabama, comprised of the Mobile Battle Guards, the Mobile Cadets and the South Carolina Battery, all under the command of Lt. Col. James Williams of Mobile. 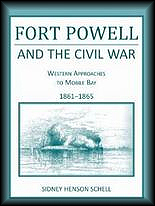 At 9 a.m. on Feb. 15, 1864, Union mortar boats opened fire on Fort Powell. Shortly after they started their bombardment, Williams wrote to his wife in Mobile: "I have been longing for such a fight as I now have on my hands for a long time, and expect to have an interesting time of it." For the next 15 days, that flotilla as well as reinforcements from Pensacola attempted to hammer the fortifications on the west side. They struggled to aim their guns in the cold north wind, but made little headway as Fort Powell and her outposts returned fire. The Union lobbed over 2,000 mortar and cannon rounds at Fort Powell, slightly wounding five men and killing one. In the end, the protracted siege would be broken by four big boxes full of air. Confederate engineers had been trying to get the heavily armored C.S.S. Tennessee over a sand bar in upper Mobile Bay so that she could join the fight. They had removed all the cannons and ammunition from the ship but still could not clear the 14-foot depth of the Dog River bar, made shallower still by northerly winds. Finally the engineers built four giant wooden boxes, attached them to the Tennessee's hull beneath the waterline, then pumped them full of air, making the Tennessee just buoyant enough so she could steam into the lower bay. On the morning of March 1st the Tennessee lumbered into view near Fort Powell. Farragut immediately ordered his more lightly armored fleet back to their home bases. The Confederate brass was so delighted with the outcome they sent Lt. Col. Williams home to Mobile for several weeks of vacation. The first Battle of Mobile Bay was a rare case of the North fleeing their position because they suddenly found themselves outgunned. Farragut learned his lesson, and when he returned in August he had 18 vessels and 5,500 men to the South's 4 vessels, including the Tennessee, and 1,500 men. And the North barely won that engagement, suffering nine times as many casualties. Thank God the Union somehow managed to win the Civil War. And thank God for Mobilians like Sidney Henson Schell. A maritime attorney by trade and an avid scuba diver and naval historian by avocation, Schell plumbed the depths of Mobile Bay history in his spare time, helping to locate and survey Civil War shipwrecks including the C.S.S. Huntsville and Tuscaloosa. He served five terms as chairman of the History Museum of Mobile. He self-published two books, "Fort Powell and the Civil War" and "The Continental Navy on the Gulf Coast," both available at Amazon.com. At the end of his Fort Powell book, Sid describes himself as "a grandfather trying to impart his love of history to his grandchildren." Re-enactors gathering at Fort Morgan this weekend owe that man a 21-gun salute. © 2015 AL.com. All rights reserved. **Added thoughts from Marshall's online responses: Mike Marshall, Jul 31, 2014 "Thank God the Union somehow managed to win the Civil War." I dropped that line in there for this reason: While I've always admired the pluck of the Confederates, who out-generalled and outfoxed the Union at just about every turn, I believe a Southern victory would have been disastrous for both sides, for multiple reasons including the perpetuation of slavery. And according to family lore, one of my paternal forebears joined Lee's Army at age 16, with the rank of "laborer," and was at Appomattox.